Wow! This is a fantastic price for this Phil & Ted package (especially in normal colors)! 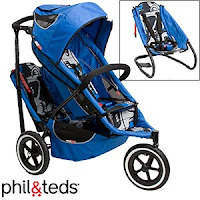 Costco.com has the Phil & Ted Graffiti Sport Buggy in blue, red or green priced at $300 with free shipping. This is a great deal all by itself, but it also comes with the Double kit to turn it into a double stroller and a Lazy Ted to turn the doubled seat into a fun bouncy seat for baby! The stroller usually retails for around $550 with the doubler, and the Lazy Ted will run you an additional $50-$60! Even if you're not a member, you can order this stroller and pay a 5% surcharge, so your total would be $315 plus any applicable taxes. Still a fabulous deal for this top-of-the-line stroller!